We’d love your help. Let us know what’s wrong with this preview of Folk Horror Revival by Andy Paciorek. To ask other readers questions about Folk Horror Revival, please sign up. What is Folk Horror? How can it be defined? Can it be defined or are its many strands too myriad to be combined into a whole? I’ve always known that it combines several main themes such as a trio of classic British horror films, folk customs, 1970’s childrens TV programmes of the kind that they don’t seem to make anymore and also an affinity with the landscape and what it means to us. But Folk Horror is always evolving and a look through the posts on the Folk Horror Revival Facebook page would indicate that there’s more to come. This is a book that I read from cover to cover as it contains many themes and you’re not quite sure what the next piece might offer. However, I feel that this book is really one to dip into or to close your eyes, open it randomly at a page and see what you might find. The central themes of Folk Horror are in this book such as ‘70’s cult horror movies like ‘The Wicker Man’, public information films warning children not to play near water, myths and legends, traditions such as the Jack in the Green and how easily new folklore can be created. The Field Studies first edition came out in 2015. 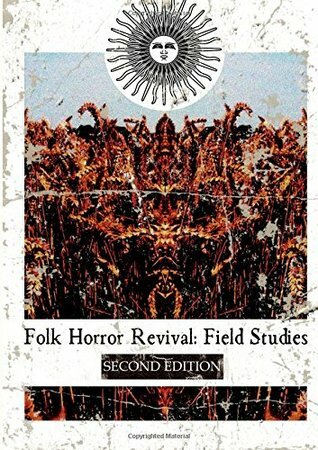 In this, the second edition, Andy Paciorek attempts to define folk horror. He’s one of the creators of Folk Horror Revival and sees the genre, for want of a better word, spreading out its roots from a trio of ‘70’s films, the aforementioned Wicker Man, Blood on Satan’s Claw and Witchfinder General. These are very British with the landscape and ritual featuring people outside their society. There are 65 pieces in this book and I enjoyed them all. My favourite was the interview with Gary Lachman who, yes, was once part of Blondie but has since reinvented himself. In one part of the interview he talks about his theory on synchronicity. This is something that happens to me a lot and I’ve never attached much significance to it as it always seems very random. But just recently I had one that was so bizarre that I am inclined to agree with Lachman’s theory about it i.e. something out there is interested in what you’re interested in and is making a comment about it. Hmm, I’ll have to think more about that one. The Traditional Jack in the Green by Chris Walton – a short history on this Mayday ceremony and its revival. I stumbled on the Hastings one and have managed to attend several since. I do miss it no longer being located in the Castle though. The Deptford version was a magical experience as we marched through Greenwich Park to the bemusement of onlookers. I loved the short interview and introduction to the work of artist Julia Jeffery – really beautiful images. Weird Americana by Andy Paciorek was a look through series like Twin Peaks, Carnivale and others which proves that strangeness isn’t only confined to the English. The Fears of the River – a reflection on Davis Grubb’s The Night of the Hunter by Stephen Canner was a fascinating appraisal of the book that inspired the classic, atmospheric film with Robert Mitchum’s memorable performance as Preacher. One of my favourite films. All you know about Vampires is wrong by Tina Rath in which Ms Rath discusses all the traditions associated with vampires and disproves them. The Old Hag Phenomenon by Jasmine Gould. I’ve always found this to be a very creepy sounding night time experience although it’s never happened to me. Albion’s Children: The Golden Age of British Supernatural Youth Drama again by Andy Paciorek – a nod to one of my memories Ace of Wands – loved it. An appreciation of M R James The Presence of More Formidable Visitants by Jim Moon in which he makes a case for the writer of classic ghost stories which are rooted in English folklore. It was refreshing to read a book that made me want to get out and explore some of the subjects further. This book would make a wonderful introduction for anyone new to Folk Horror and its myriad elements. The pieces are well written by people who are either very knowledgeable or passionate about their particular subject. Although in the case of the Old Hag perhaps too well. Field Studies is well produced with good production values with the lovely, elegant FHR motif on the front cover and inside. But a definition of Folk Horror? Not quite but perhaps this book will give you some ideas of your own. Skipped a couple of chapters due to spoilers (but will go back to later) but lots of interesting essays with recommendations for books, music and films to go to or revisit, plus many websites to check out at some point in the future. Drawn mainly to the worlds of myth, folklore, symbolism, decadence, curiosa, anomaly, dark romanticism and otherworldly experience, and fascinated both by the beautiful and the grotesque and the twilight threshold conciousness where these boundaries blur. The mist-gates, edges and liminal zones where nature borders supernature and daydreams and nightmares cross paths are of great inspiration.